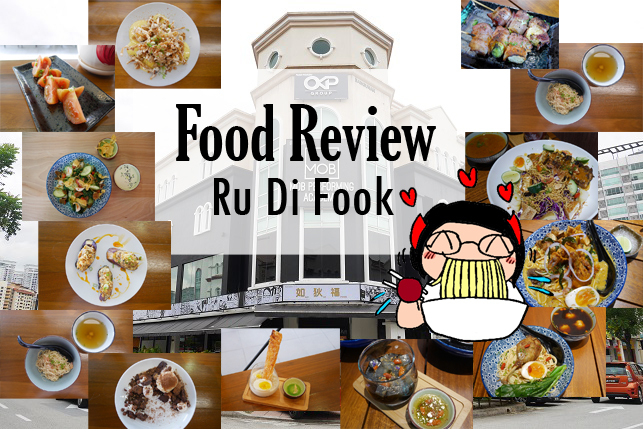 Ru Di Fook Noodle Bar @ Kota Damansara. When I first enter into this restaurant, I was caught with surprised on how spacious, cozy and clean this place. The amount of light penetrates into is enough for me to snap a few picture that worth putting onto your instagram account. Strong aromatic yet it makes me feel relax just by smelling it. 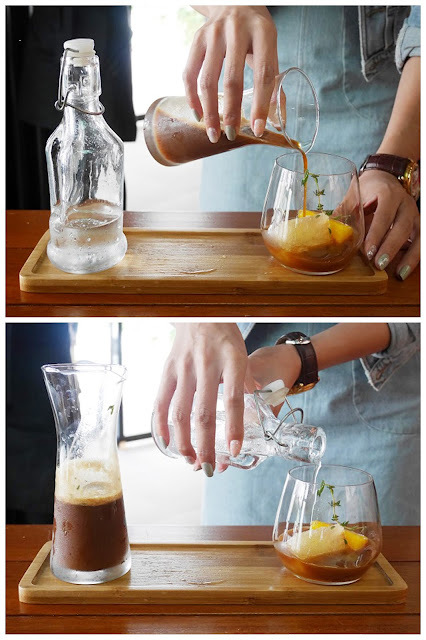 Tasting a diluted coffee in citrus flavour. Perfect choice for people who are looking for a not-too-bitter coffee flavour. This is how to adjust your citrus black, according to your preference. 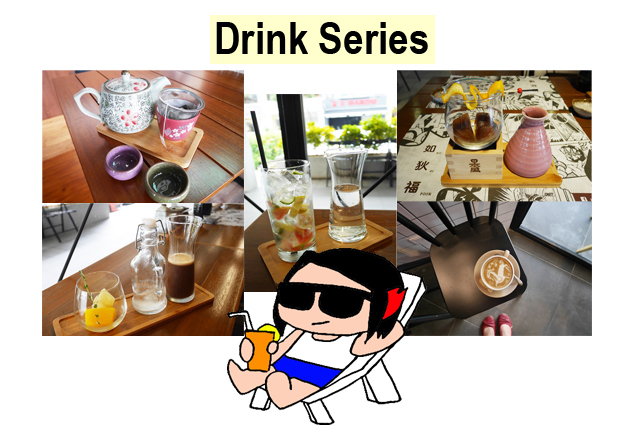 Very cooling to have this drink under the hot, sunny day! Another choice of fruity-flavour drink for your consideration. As I mentioned earlier on, one of the co-founder: Ken is specialized in coffee, and the latte he prepared will definitely not letting you down! Imagine having this kind of afternoon tea at this place. Soury taste yet retaining the freshness of tomato, a perfect dish to kick-start your appetite! Salad comes with fuyu dressing & cracker, creating a rather tasty flavour while mixing together with fresh cucumber, chinese xiao bai chai and cherry tomato. 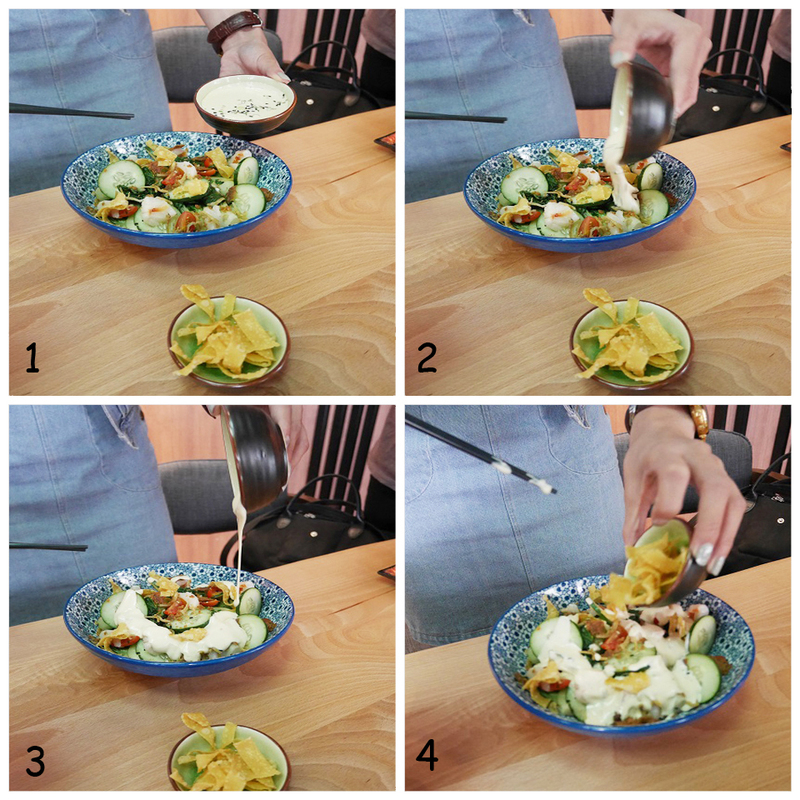 The process on how to mix caesar salad. 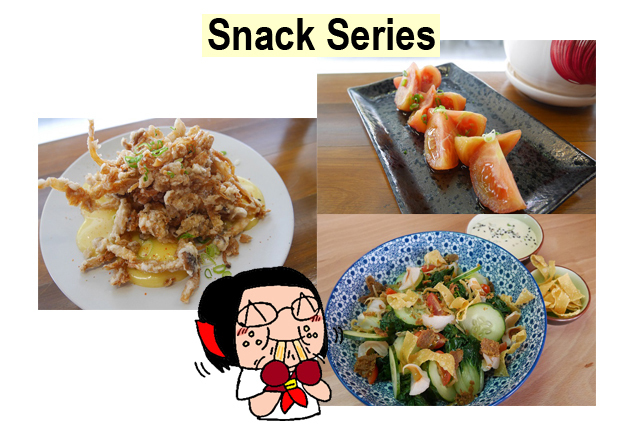 The 3 combination was surprisingly turns up to be a delicious finger-size bite food! 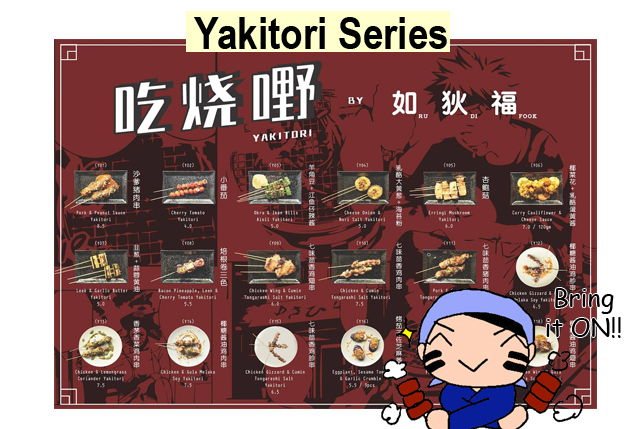 Yakitori is not a strange words when it comes to Japanese food. However, the chef in Ru Di Fook had prepared each and every of yakitori not only great in taste, but also retain its Malaysia characteristic. Japanese mushroom in yakitori style. Okay, maybe this is not so Malaysian-ish. Nonetheless, it still taste great! The mushroom was in a perfect structure. You can't find any ikan billis, yet you taste it! Soaking the leek with butter to soften its surface & creates more aromatic taste. You won't tell the different that that is ACTUALLY a cauliflower. Reminds me of satay in pork flavour lol. That sauce is da BOOM! While the chicken maybe a little hard, it's the sauce that makes the difference! Tender, chewy pork in yakitori. Needed I elaborate more? I've no idea that bacon is a good pair of pineapple, leek & cherry tomato! Or was this due to the chef's magical masterpiece? When comes to wan tan mee, everything was made with scratch: the noodles were handmade with duck egg, creating this strong aromatic flavour that triggers your taste bud. On top of that, the soup were also prepared by stuffing with scallop, dried pork skin & prawn, not adding any preservation, which makes the whole dish healthy and safe to consume for more. In Ru Di Fook, the wantan mee served in small size, just like adopting Boat Noodle's concept. Depending on your preference, you can add more herbal taste into your jelly to balance the flavour. This is an upgraded version of Rojak, with noodles & meat adding into the plate. Still, the laksa flavour is there. The soft-shell crab was indeed crisp and blended well in this plate. A hand-made noodle and herbal soup where you have no reason not to resist that piece of duck on that plate. My childhood food!!! I still remember those day where I used to stuff mountains of milo onto my vanilla ice-cream. This dish brought back heaps of memories! This wonderful combination of gingko barley and beancurd sheet will sweeten up your afternoon day. 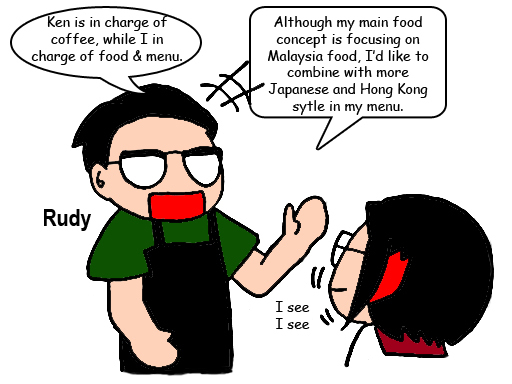 Ru Di Fook holds a very firm slogan: Eating is a blessing (能吃是福) when comes to preparing food and drink to the customer. It's no wonder the food served today were able to bring so much joy to me and my company. The noodles were so good that I'd prefer to take time to eat on it, so I could enjoy its max flavour lol. I highly reckon this place for lunch / dinner for gathering purpose.